Three years ago, one of the UK’s top voice artists died suddenly. It wasn’t just a sad loss for his family and the Voice Over world, but Mike was also an amazingly talented writer and evangelist for good radio advertising. Somewhere in the vaults of Capital Radio Nottingham/ Trent FM is a splendid video of a presentation Mike did for clients of the station. His eyes sparkle with passion as he talks about how to make radio advertising WORK. In the voice over booth we got some of the best out takes. His sharp wit taking over when his voice tripped on some over-written agency sows ear. Or an explosion when he got a take wrong. Some Voices will give you a glance when they finish a read and you KNOW that they think they’ve not done it as well as they could.. but they hope it’s good enough for the producer. Mike wouldn’t do that. He’d immediately volunteer to give a better take. He wanted to give his best…. Even for the voice fee of a £14.90 local radio script. I remember spending time with Mike at Radio Aire in Leeds. He used to visit Yorkshire TV next door and then pop in to a) see if there was anything we needed voicing b) wait to pick his son Mikey up from school and c) just pass the time chatting animatedly about radio, what was good, what was bad and what needed putting right. I considered Mike as a good friend. See if you can spot the duvet in the studio! When Mike was doing sessions down the ISDN Line he would put the duvet over his head to create the sound proofing. I can’t believe it’s nearly 3 and a half years since he passed away. I can still hear his voice. There’s a fascinating debate going on about how to say road numbers in Radio Commercials. Did I say fascinating? What some people may not realise is there is thought put into these things. How do you say a road number or a phone number to help it stick in the mind? The A1236 somewhere near a phone box... remember them? You want to be the voice on your own commercial? Just because I can sing a few bars of a song doesn’t mean I want to humiliate myself on the X Factor!! Frankly there are only a handful of clients who should ever be let near a microphone. You may have a nice voice but it may not be right for the delivery… may not sound good on air, the ads may not be written for your delivery, the station may have a policy not to allow client voiced ads, many clients freeze in front of a microphone (quite common). Also you think that you will get your ad cheaper because you’re not employing a professional voice artist to voice the ad. Well, I usually charge double. Eeek… why? Because it’s going to take twice, or even 5 times as much time in the studio to voice and edit the audio, that the professional would have given me in one, unedited take. Some radio stations have a policy of not allowing clients to voice their own commercials, and you will understand why when you hear some of the stations that do allow it. The professional voices used are very skilled at talking to time, talking clearly, not sounding like they are reading, bringing out the main copy points. They are also skilled at getting it right after just a couple of takes. If you have little or no experience it will take you a long time in the studio and time is money. At the end of it you may end up with a radio commercial that the station Programme Controller will not want played on his station. Now you’re thinking I’m against client voiced commercials? No. I’m not against using the clients voice… it’s just it may be best to use the voice for a small part of the ad… maybe delivering your customer service promise of a tag line? 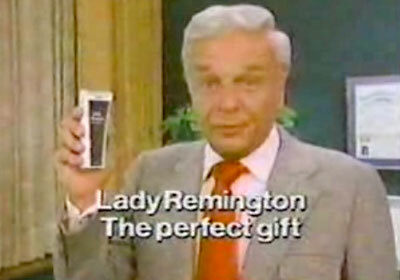 Maybe you DO have the charisma to deliver the ad… like Victor Kiam. But you need to work really hard… first to get commercials written that you can deliver, and time spent in the studio to get it right. In Newcastle in the late 1980’s there was the phenomenon that was Mr. Rahman. An elderly Hindi gentleman that voiced his own commercials. They were famous… and he even was used to make announcements at Newcastle United for a while. But every sentence he said had to be edited and painstakingly put together to make his ads. So take the advice of your writer or the station’s commercial producer. Perhaps voice just a couple of lines? Perhaps there is someone who could be your “voice” or perhaps rather than use your voice we could develop a character? There are a handful of clients who voice their radio commercials very successfully, but for every one that does there are a couple of dozen that sound dreadful on air and don’t do themselves any favours. The real question is why do you want to voice the commercial? Is it because you want your friends to hear you on the radio station or is there a good, solid business reason. If there is, communicate it to the writer and see whether he or she comes up with. The client phones me and tells me he has had an idea. It’s using an impression of Richard Wilson with the final line “I don’t believe it” I don’t believe it, it’s the third time that month I have to explain that the radio station and the client could be sued. Richard Wilson is available to do Voice Overs and makes a portion of his living from that kind of work. An impression of him is a form of theft. You could use the genuine article, but he may not do the catch-phrase and is probably sick to death of people asking him! AND how long ago was that show on mainstream TV? Talk to your writer. A well known personality could add so much to your campaign. Some Celebrities make themselves readily available for radio work, have great agents and are a delight to work with, but there others who you wont get past their agent because they “don’t do radio”. Some people wont do certain products or services either for personal reasons or because they are already tied to a regional or national advertiser in the same category, or their tied into a contract, like soap stars usually can’t do commercials or people doing Motoring Programmes may not be able to do car ads. Just try booking Jeremy Clarkson for a Motor Dealer ad! Some are just too busy to do radio… and don’t need the money. Some just can’t do it. Voicing is a skill and not everyone can do it… even some well known actors just can’t perform in front of the radio microphone. Your writer can advise you, find agents, organise sessions, book studios in the capital, where most celebs want to work, or find studios around the country. You will pay a premium for Celebrity Voices, but it can be a lot less than you think. Think about producing multiple ads at the same time because the more ads you have done at once the more cost effective it can become. Your writer will be able to give you a quote. They will be written for that specific person. Don’t expect that the scripts written for Tom Baker can be voiced by Joe Pasquali. You WILL have to pay a fortune if you want any kind of endorsement. So don’t expect John Doe to say “Hi, this is John Doe and I love Billy Burn’s BMW Garage” You will be expected to pay thousands if the VO even agrees to do it. Most of the time you are employing the actor to play a part. The voice must be recognisable. You might not be able to name the person but their voice will be familiar. Make sure the voice would convey your sales message effectively. Ask the writer why he chose the voice, they should have specific reasons. And book the celebrity… not the part they play on a TV show or in a movie. That part doen’t even belong to them…. so book Richard Wilson… but don’t expect him to be the “One Foot in the Grave” character. And one more danger! Make sure that your product or service is remembered FIRST… NOT the celebrity voice, with the listener not remembering what the ad was about. The Celebrity voice sould be there to make you think MORE about the product or service.